The Wild Cards universe has been thrilling readers for over 25 years. In Carrie Vaughn’s “The Thing about Growing Up in Jokertown,” a group of teenage jokers yearn to explore outside the confines of their strange little neighborhood and get a real taste of the Big Apple. 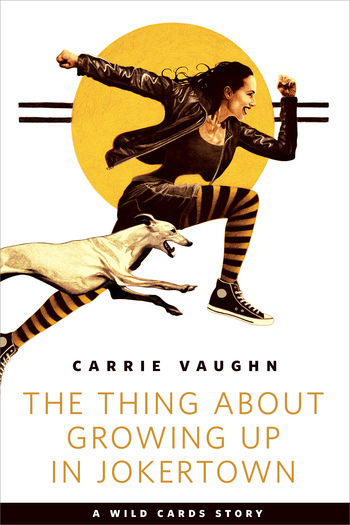 Carrie Vaughn is the New York Times bestselling author of the Kitty Norville books, including Kitty's Big Trouble, Kitty Goes to War, and Kitty and the Midnight Hour. She is also the author of the standalone novels After the Golden Age and Discord's Apple, and the young adult books Voice of Dragons and Steel. Vaughn had the nomadic childhood of the typical Air Force brat, with stops across the country from California to Florida. She earned her B.A. from Occidental College in Los Angeles, and a master's in English from the University of Colorado at Boulder. She has worked as a Renaissance Festival counter wench, a theater usher, an editor, a buyer at an independent bookstore, and an administrative assistant. She lives in Boulder, Colorado.